Charles Wallis is a graduate of the Baylor University fine art program as well as outside courses during high school. After college he opened a graphic design studio beginning his career as a professional artist and taught graphic design courses at Baylor University in the evenings while in business. He focuses most on water scenes wildlife, western and southwestern landscapes using oils or acrylics. He resides in Coldspring, TX on Lake Livingston and has lived in Arizona and both of these locations influence his work. He also has travel extensively which shows in his painting subjects. observations of nature. Many subjects interest me but I am most focused on the West and Southwest as well as nature and wildlife around Lake Livingston incorporating the techniques of the old masters with modern materials for traditional realistic painting in oil and acrylics. May 2012 - Light, Space and Time Gallery, Nature Art Exhibition including art and photography. First Place Overall, First Place in Painting and Art Media. 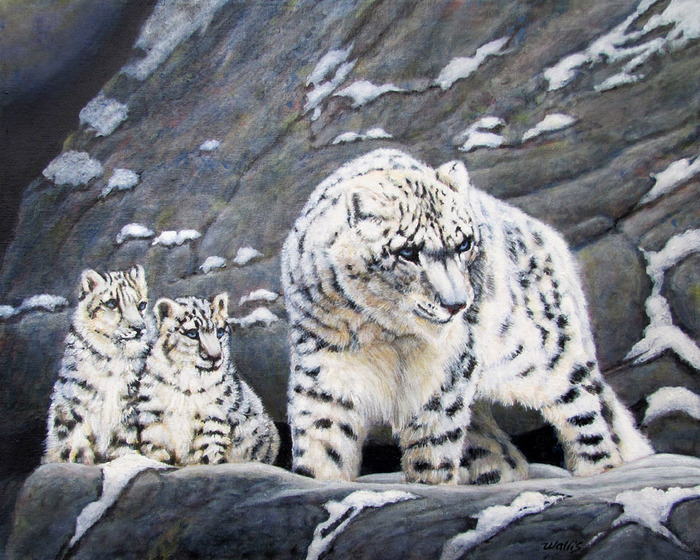 February 2012 - Woodlands Art Trust, "Snow Leopards Protects Her Cubs" was chosen as one of 20 painting for exhibition and received a People's Choice Award and purchased by the Trust. February 2012 - Western Spirit Art Show, Old West Museum, Cheyenne WO featured three of the artist works. November 2011 - The Artistic Circle: Spirit Totem Exhibition, one painting in the show which has received "Honorable Mention" recognition among the entries. November 2011 to February 2012 - The Art Center of Waco Invitational Exhibit, Two paintings of the artist were showing in the juried competition and sold during the show. March 2011 - Western Spirit Art Show, Old West Museum, Cheyenne WO Four of his paintings were chosen for the show. Opening night 3 of the 4 paintings sold. April 2011 - His work was shown in the Spring/Summer Issue of Artist Portfolio Magazine. 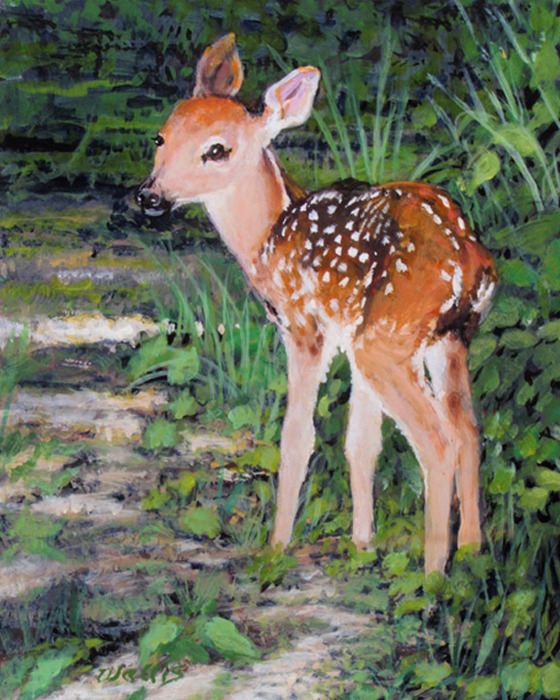 January 2011 - 2011 International Juried Realism Art Show, He received Honorable Mention for his wildlife paintings. December 2010 - Landscapes Art Competition, sponsored by the Light Space and Time Art Gallery, he received special recognition for two of his landscape paintings. September 2010 - 9th Annual National Wildlife Show sponsored by the Irving Art Association. His "King Of The Hill" painting of a bull elk won first place in the oil painting category. July 2010 - Four of his western paintings were shown in the Uncorked Art Show in Salado, Tx. July 2010 - One of his horse paintings "High Desert Mare" was chosen for the Atlanta Equestrian Show. and is on the endangered list. 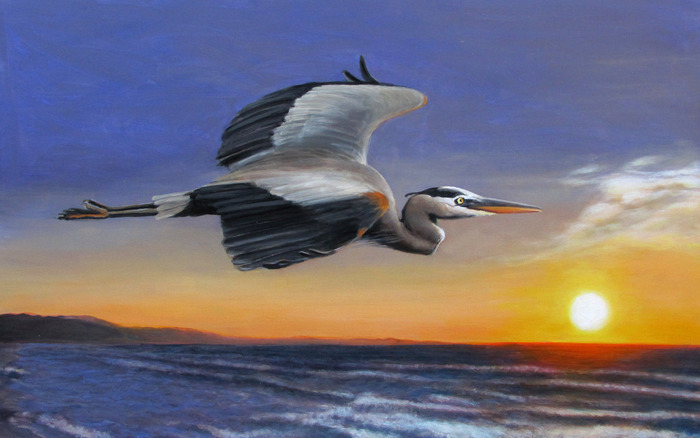 30 X 48, oil on canvas-A great blue heron in flight at sunrise over the north end of the lake. 24 X 48, acrylic on board-The Texas state flower the bluebonnet grows wild in many fields. 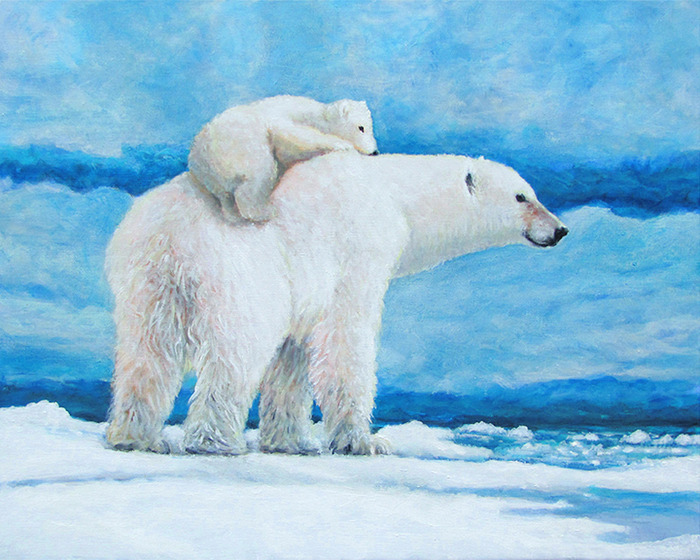 16 X 20, oil on canvas-A mother polar bear prepares to enter the icy water to move to another ice flow. 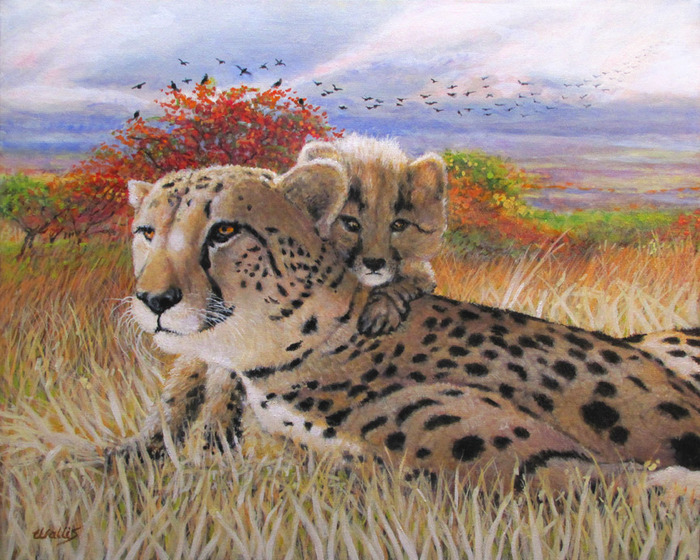 16 X 20, oil on canas-A mother cheetah and her cub sun on the savannah during a spring afternoon. 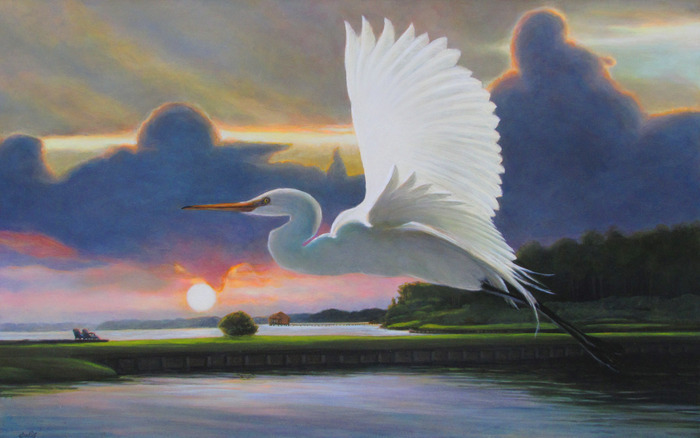 30 X 48, oil on canvas-A great white egret launches into flight at sunrise. 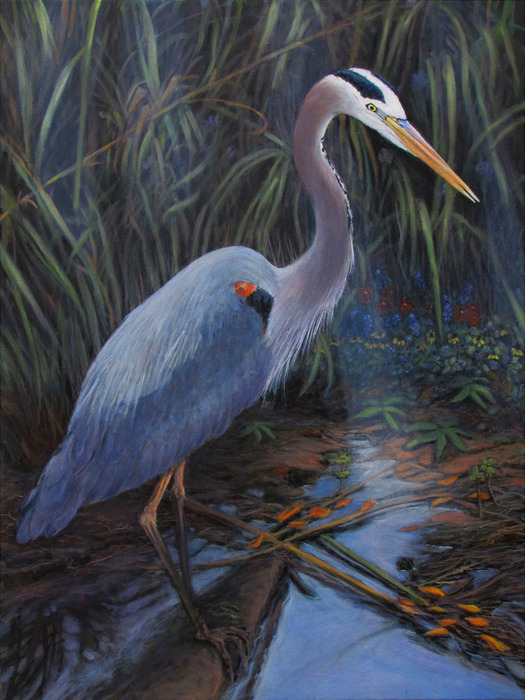 30 X 40, acrylic on canvas-A great blue heron searches for a meal in the shallow back water. 24 X 48, acrylic on canvas-Cactus come in many colors depending on the soil they are in. In some areas they can be purple, magenta, orange shading, yellow and green.